For a clock updated by radio signals which is sometimes incorrectly called an "atomic clock", see Radio clock. For the clock as a measure for risk of catastrophic destruction, see Doomsday Clock. For other topics, see Atomic Clock (disambiguation). Most of the complexity of the clock lies in this adjustment process. The adjustment tries to correct for unwanted side-effects, such as frequencies from other electron transitions, temperature changes, and the spreading in frequencies caused by ensemble effects. [clarification needed] One way of doing this is to sweep the microwave oscillator's frequency across a narrow range to generate a modulated signal at the detector. The detector's signal can then be demodulated to apply feedback to control long-term drift in the radio frequency. In this way, the quantum-mechanical properties of the atomic transition frequency of the caesium can be used to tune the microwave oscillator to the same frequency, except for a small amount of experimental error. When a clock is first turned on, it takes a while for the oscillator to stabilize. In practice, the feedback and monitoring mechanism is much more complex. For context, a femtosecond (6985100000000000000♠1×10−15 s) is to a second what a second is to about 31.71 million (7007317100000000000♠31.71×106) years and an attosecond (6982100000000000000♠1×10−18 s) is to a second what a second is to about 31.71 billion (7010317100000000000♠31.71×109) years. 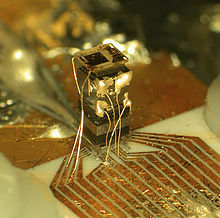 In March 2008, physicists at NIST described a quantum logic clock based on individual ions of beryllium and aluminium. This clock was compared to NIST's mercury ion clock. These were the most accurate clocks that had been constructed, with neither clock gaining nor losing time at a rate that would exceed a second in over a billion years. In February 2010, NIST physicists described a second, enhanced version of the quantum logic clock based on individual ions of magnesium and aluminium. Considered the world's most precise clock in 2010 with a fractional frequency inaccuracy of 8.6 × 10−18, it offers more than twice the precision of the original. 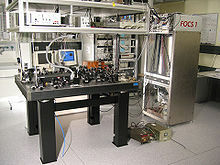 In 2013 optical lattice clocks (OLCs) were shown to be as good as or better than caesium fountain clocks. Two optical lattice clocks containing about 10 000 atoms of strontium-87 were able to stay in synchrony with each other at a precision of at least 1.5 × 10−16, which is as accurate as the experiment could measure. These clocks have been shown to keep pace with all three of the caesium fountain clocks at the Paris Observatory. There are two reasons for the possibly better precision. Firstly, the frequency is measured using light, which has a much higher frequency than microwaves, and secondly, by using many atoms, any errors are averaged. Using ytterbium-171 atoms, a new record for stability with a precision of 6982160000000000000♠1.6×10−18 over a 7-hour period was published on 22 August 2013. 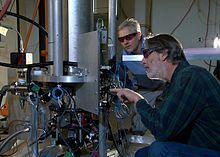 At this stability, the two optical lattice clocks working independently from each other used by the NIST research team would differ less than a second over the age of the universe (7017435494880000000♠13.8×109 years); this was 10 times better than previous experiments. The clocks rely on 10 000 ytterbium atoms cooled to 10 microkelvin and trapped in an optical lattice. A laser at 578 nm excites the atoms between two of their energy levels. Having established the stability of the clocks, the researchers are studying external influences and evaluating the remaining systematic uncertainties, in the hope that they can bring the clock's accuracy down to the level of its stability. An improved optical lattice clock was described in a 2014 Nature paper. In 2015 JILA evaluated the absolute frequency uncertainty of a strontium-87 optical lattice clock at 2.1 × 10−18, which corresponds to a measurable gravitational time dilation for an elevation change of 2 cm (0.79 in) on planet Earth that according to JILA/NIST Fellow Jun Ye is "getting really close to being useful for relativistic geodesy". At this frequency uncertainty, this JILA optical lattice clock is expected to neither gain nor lose a second in more than 15 billion (15 × 109) years.